Summer time, and the livin’ is eaaaasyyyy. If there is anything that says “Hey, Summer! Let’s do this!“, it’s a popsicle. I’ve come a long way with my pop-making repertoire since pulling those long plastic sticks from the freezer (or drinking them before they were frozen, if we’re honest with each other) as a kid. 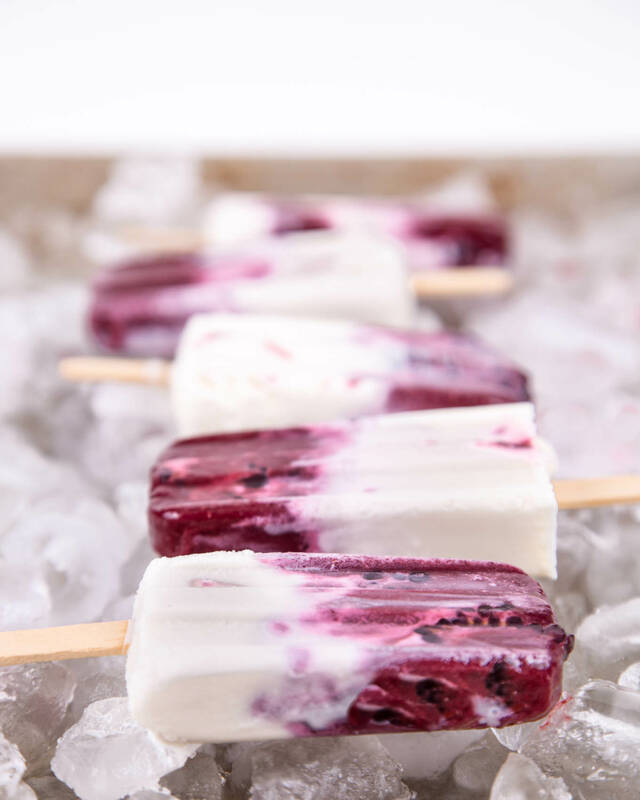 I’m teaming up with Driscoll’s Berries for what may have just become my new all-time favorite frozen treat — Blackberry Lavender Cream Paletas. 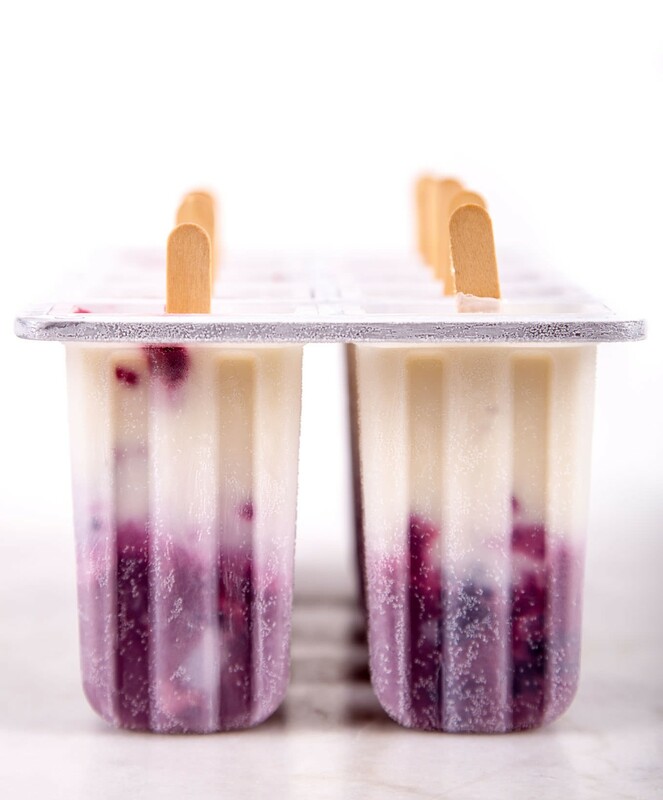 We’re infusing some sweetened cream with lavender, and stacking it in a pop with fresh blackberries. Prepped in just minutes, and ready to grab whenever you want. I partnered with Driscoll’s because of the massive number of times that I have used their products. I always have great results, with the most fresh berries available just down the street at my favorite grocery. For these paletas, I grabbed some Driscoll’s Organic Blackberries, fresh cream, and headed home. Nothing fancy and complicated here, y’all. Just pure, perky berry perfection. If your ingredients are great, your food will be great. It’s super convenient to be able to pick up a quality batch of berries from most groceries. 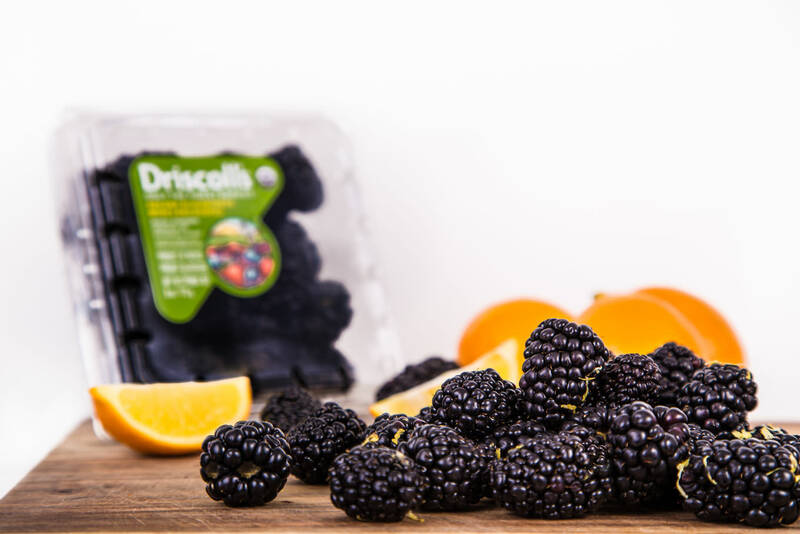 Driscoll’s is a brand that has been around, and family-owned, for over 100 years. They began in 1904 (before berries were cool) with Sweet Briar Strawberries, and it continues today as one of the best known berry brands. I grew some lavender last year, drying what was left, to tuck away in a jar for a rainy day. While it was more like 85 out and far from rainy, this was the perfect time to use a bit of it up. Since I can assume not everyone is as much of an herb hoarder as I, you can usually find dried lavender (which actually works much better than fresh) at herb and tea shops, health food groceries, farmer’s markets, or even just order an entire half pound from Amazon for less than $10. The first time I made this recipe, I used regular cream with a bit of sugar. It was great. 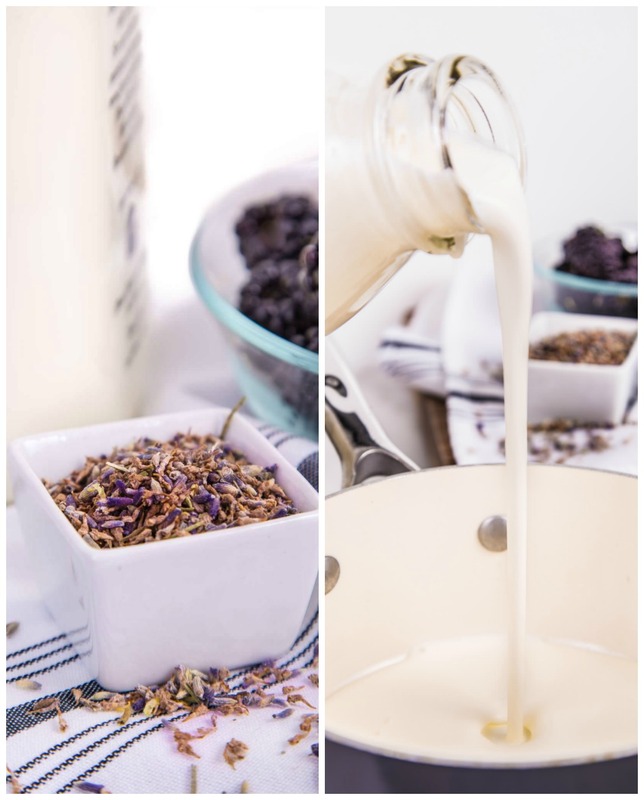 Because, well, cream… The second time, I decided to try to infuse the cream with the dried lavender that was just sitting around waiting for some attention. It was SO much better! The sweet aromatics of the buds work together with the blackberries to really highlight the natural sweetness and flavor. There is nothing worse than a popsicle without a punch. You want to pack as much BAM! into that pop as possible. The extra 5 minutes that it took to infuse the cream is totally worth it. Eat a couple of the berries while you wait. Save a few, if you can manage. The idea to make a paletas, or a Mexican gift of fresh fruit popsicles, came straight from my own home of Nashville. There is a tiny little famous shop here that serves paletas with the most exotic of flavors. You can pretty much guarantee that when you go pick one up, you can pick a new flavor that you’ve never had before. What makes a paleta / paleta helada / icy lolly / whatever you feel like calling it special is that instead of using a water base like popsicles do, it uses 100% fresh fruit instead of whatever they put in those popsicle sticks that I had as a kid. While they can use water or milk as the base, I prefer the milk/cream option. You end up with this super-smooth, fresh fruit dessert. The fresh fruit pieces give it great texture and reminds you that you are eating something special. Now is when I would loved to have included some pictures from when I’ve been to Mexico and had paletas straight off of the street. The problem is that I ate all of the said paletas on the street before I had time to think about taking any pictures. Priorities, y’all. You’re just going to have to trust me on this one. Don’t tell anyone that I said it, but I’m pretty sure these are pretty healthy. Fresh berries, great quality milk or cream, and more berries. It’s basically like breakfast on a stick, right? For all of you cool moms & dads out there, you could totally make this a chill summer project. If you prefer to keep more cats than one should instead, you can do what I did and just make them to enjoy with friends on a blazing hot patio porch party day. Whatever excuse you need to give to make these for yourself, use it. 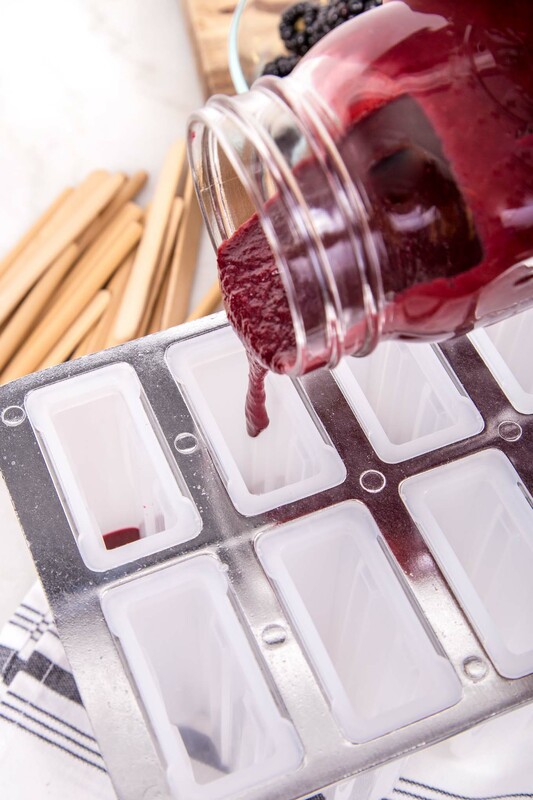 You can make the paleta pops in just about anything that will freeze. I’ve used tall shot glasses (for my Pineapple Chili’d Ginger Pops), glass cups, ice cube trays. Whatever you can throw in the freezer is fine. For these, I used this cute little mold that I tossed into my cart during what I apparently thought was another black friday buying frenzy last week. It’s that 2-day shipping, y’all. I just can’t help it. Filled and frozen, I quite literally jumped out of bed and ran downstairs to check the freezer to see my precious pops. They worked sooooo sooo well! My poor neighbors probably thought I had just made the best breakfast in the world. Turns out, I had. PS- You can totally eat a popsicle on a work morning commute. I recommend a bib. Layering the fresh Driscoll’s Blackberries with the sweetened infused cream was super easy. I was a bit worried about that process at first, wanting nice layers so that when you eat it, you get distinct flavors with different bites. Success! The fresh berry purée (straight up berries, a splash of Meyer lemon, and sugar) held it’s own and stayed put below and on top of the cream. The whole berries fit perfectly into the molds. This is summer at it’s finest. Fresh fruit, simple recipes to let you spend more time outside laughing with people, and an excuse to eat dessert for breakfast. Send all invites to summer parties to my Snapchat (southernfatty). Enjoy, y’all! 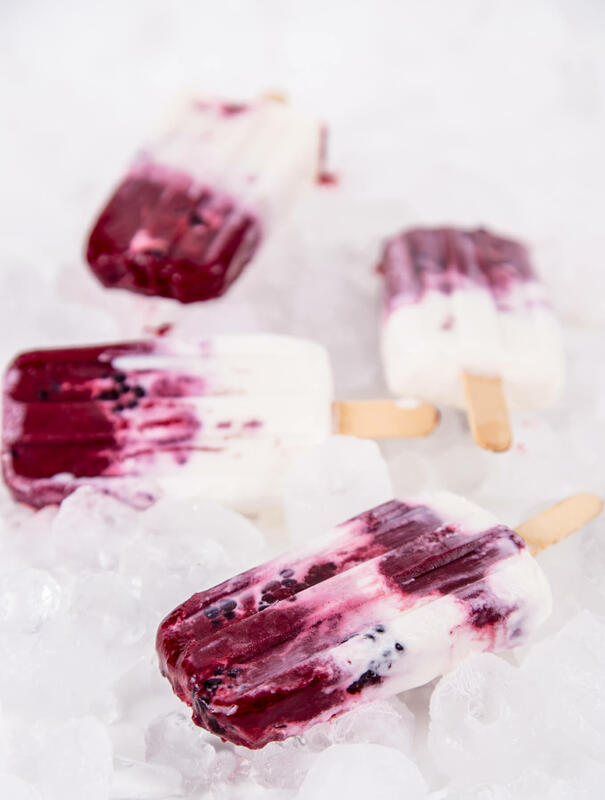 Fresh fruit paletas / popsicles with organic blackberries and a splash of Meyer lemon, layered with sweet lavender-infused milk & cream. 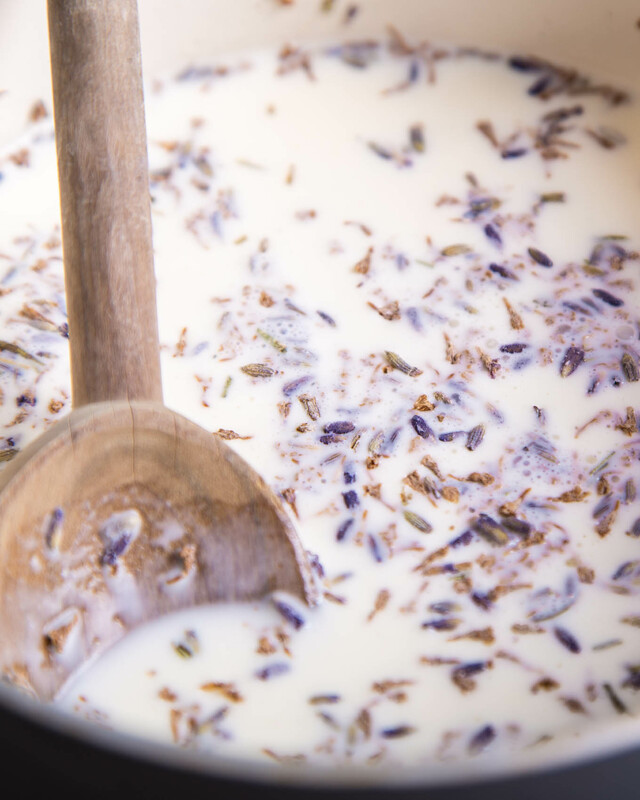 In a small saucepan over medium-low heat, combine milk, cream, sugar, lavender and simmer for 5 minutes. Note: This amount of lavender gives a fairly strong flavor. Reduce amount before steeping if you prefer less. Remove from heat and strain. Discard lavender buds. 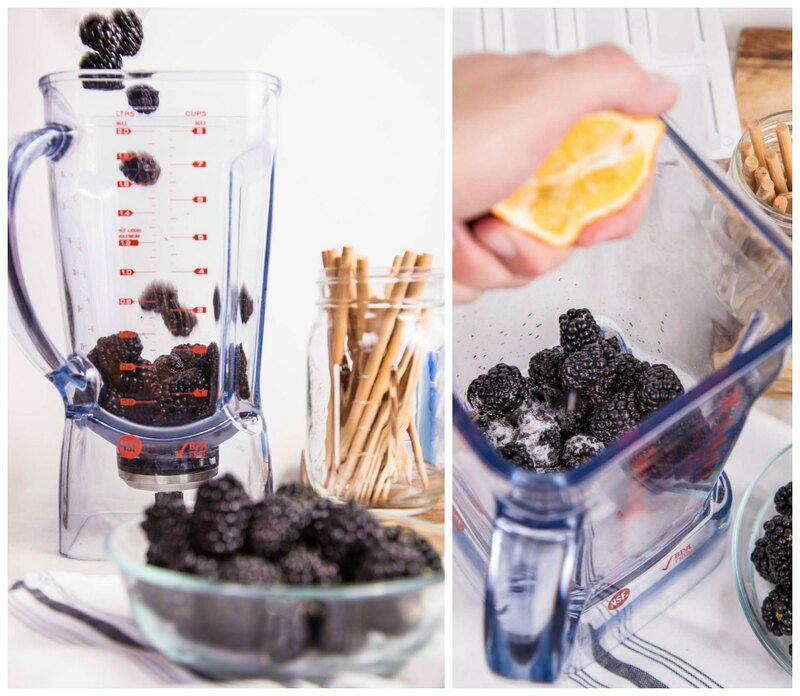 Combine whole organic blackberries, sugar, meyer lemon juice and zest in blender. Strain well and reserve juice. I prefer to start by adding blackberry puree, followed by a couple whole berries, carefully layer cream on top and drop a few more berries inside. Add a bit of the remaining blackberry puree to the top. Place stick and freeze (preferably overnight). Find more recipes like this one at SouthernFATTY.com. Be sure to check out my Instagram account today, as we are taking over the Driscoll’s Berry account in cooperation with FeedFeed, where I edit the Pies/Tarts & Cakes feeds. 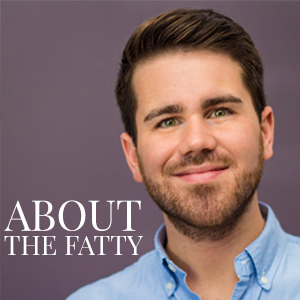 This is a sponsored post in partnership with Driscoll’s and FeedFeed. Statements are my own. oh my goodness! these look so good and pretty! These look sick Phillip! I definitely need to make these! 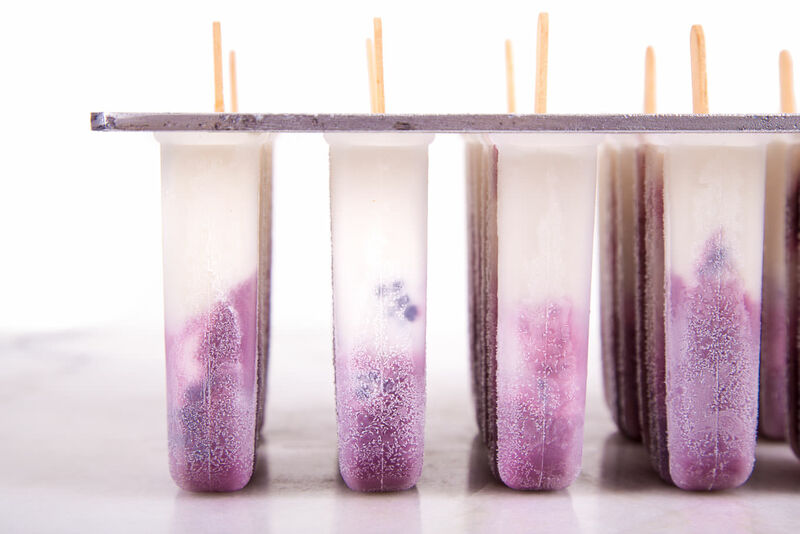 Lavender is one of my very favorite flavors, and I LOVE paletas. My husband doesn’t care much for either. More for me. These look amahzing. My favorite ice cream shop, Bi-Rite, in San Francisco makes the most incredible honey lavender ice cream. Its surprising how good it is in ice cream! Yummmmm! The lavender in this totally sets it off the charts!